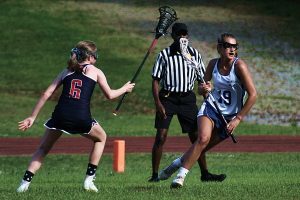 Phoebe Ringers and Kate Snyder combined for 11 goals to rally the Dunwoody Lady Wildcats to a 16-4 non-region victory over the Chamblee Lady Bulldogs at North DeKalb Stadium on Monday night. Trailing 3-1 with 6:12 to play in the first half, Snyder scored the first of her three goals in the final 3:38 of the first half to really Dunwoody to a 5-3 advantage of the half. It would be the start of 16 unanswered goals for Dunwoody. Ringers would follow less than a minute later with her second goal of the half to tie the score at 3-3 with 2:26 to play. Snyder would strike just 30 seconds following Ringers’ goal to give Dunwoody the lead at 4-3 and with 45 seconds remaining to send the Lady Wildcats (7-5) to the half up 5-3. Chamblee goalie Jamie O’Melia who battled the entire game against the Dunwoody pressure made one of her 13 saves in the game early in the second half to keep the game within the 5-3 margin. Ringers would then score twice in 20 seconds on an assist from behind the goal by Snyder and by using a spin move into a shot for the second goal a 7-3 Dunwoody lead. O’Melia would come up with two more saves over the next four minutes to keep the Lady Bulldogs in the game until Ringers struck again from the left side with 18:18 to play to make it 8-3. Grace Cooper and Ellie Levy would score back-to-back goals to extend the lead to 10-3 with 13:07 to play. Six more saves by O’Melia in the next six minutes were not enough as Jenna Hogan and Ringers would add two goals apiece to make it 14-3 with 6:28 to play in the game. Hogan would add here third goal of the game with 3:44 to play and Snyder would pick up her fourth at the two minute mark to close out the Dunwoody scoring. Kacie Lowery ended the scoring drought for Chamblee at the 49 second mark to pick up her third of the game. Chamblee answered Ringers’ opening goal of the game with three consecutive on the way to the early 3-1 advantage. Natalie Roberts tied the game at 1-1 with 15:42 to play. Lowery would score at the 8:58 mark and 6:12 mark to make it 3-1 in favor of the Lady Bulldogs (0-10) before Dunwoody went on the 4-0 run to end the half. Dunwoody is closing in on a playoff berth which would be the program’s first and put the Lady Wildcats into the playoffs the same year as the Wildcats who clinched a playoff berth earlier.